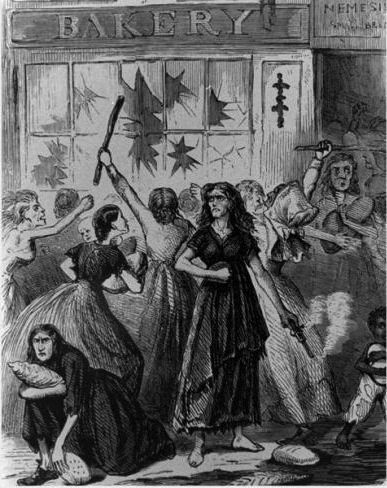 This May 1863 illustration, titled “Southern women feeling the effects of the rebellion, and creating bread riots,” shows the uprising in Richmond. In addition to food, the rioters took candles, shoes, bolts of cloth, hats and jewelry. During the Civil War, middle class and poor Southerners suffered shortages of many food commodities – meat, coffee, salt, corn, and wheat among others. Corn and wheat were particularly dear, but shortages did not deter corn whiskey manufacturers, who found an eager market for their product. Let me be clear. Citizens north and south drank, but Northerners produced grains in sufficient quantity to satisfy both their hunger and their thirst. The Union blockade, occasional droughts, and soldiers’ absence from their fields contributed mightily to Southerners’ limited capacity to feed their population. It is but the common and spontaneous voice of the land, that if our country is lost, whiskey will be the cause of it. *** A bountiful Providence has given enough for man and beast; but distillers have already converted so much corn into poison, that prices look like famine ahead . . . . And now distiller, we ask you, in heaven’s name, is it manly, is it brave, is it not dastardly and unalterably mean to force such prices for bread on us and our children? For those not so fortunate to indulge in luxuries, the choice was to pass the jug or feed the children.